SP 213SFNw take productivity to the next level with a new PCL controller with 80 fonts, improved wireless connectivity with one button Wi-Fi setup, thicker media acceptance up to 34 lb. Bond, and automatic paper jam ejection. With adds improved usability for ID Card Copy, larger control panels with a 4-line LCD screen and illuminated hard keys, plus a higher capacity 35-sheet automatic document feeder. Offers a more eco-conscious design plus higher yield AIO cartridges for lower per-page costs with less maintenance. 4-in-1 multifunctionality in a compact desktop design featuring Brand's proven All-In-One (AIO) print cartridge technology for maximum reliability and ease of use. Efficient 23-ppm black & white output speeds at 600 x 600 dpi (Copy) and up to 1200 x 600 dpi (Print) resolutions. Powerful PCL print controller with intuitive PCL 6 driver and 80 fonts for creative, error-free printing in many styles. Embedded IEEE 802.11 b/g/n Wireless LAN connectivity for cable-free printing and scanning. One button Wi-Fi setup takes the guesswork out of wireless network configuration. Infrastructure and Ad Hoc modes supported. The 35-sheet Automatic Document Feeder quickly processes multi-page originals up to 8.5" x 14" for efficient scanning, copying and faxing. The high capacity 2,600-page AIO delivers a cost-per-page factor (ISO/IEC 19752) for low total cost of ownership. The 150-sheet Paper Tray and single-sheet Bypass are user-adjustable from postcard to legal size and accept media up to 34 lb. Bond. 4-line LCD panel for at-a-glance device monitoring and supply status. Easily convert hard-copy originals to portable digital documents with Scan-to-USB. Full color and monochrome TWAIN/WIA scanning at 600 x 600 dpi optical resolution for high quality image capture. Easily convert hard-copy originals to portable digital documents with Scan-to-USB. Standard 10/100-BaseTX Ethernet for network printing and cost-free electronic document distribution with Scan-to Email/Folder/FTP and 100-entry Address Book. Minimize wait time with fast warm up time and first print speed that saves time and energy. Printing multiple pages of a document onto one page saves paper and stretches toner yields by using N-UP Print feature. Toner save mode extends supply yields to a lower cost of ownership. Ricoh's AIO cartridge is totally recyclable so your documents have maximum impact on you, not the environment. SP 213SNw: 128 MB RAM std./max. SP 213SFNw: 128 MB RAM std./max. *ITU No.1 chart, Compression: MMR, Resolution: Standard speed: 33.6 Kbps. * Declared yield values based on ISO/IEC 19752. Actual yields may vary based on types of images printed and other factors. For maximum performance and yield, we recommend using genuine Ricoh parts and supplies. 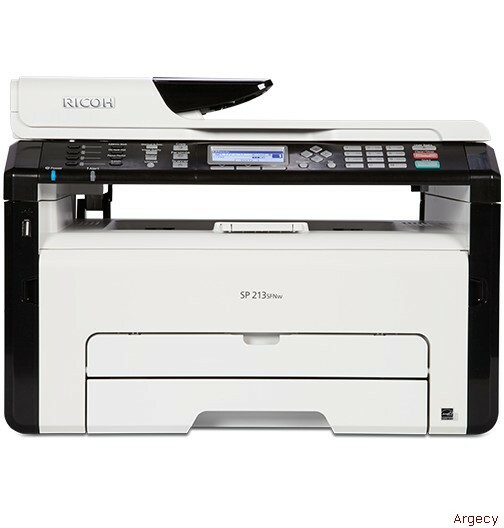 The Ricoh SP 213SNw and SP 213SFNw ship with a starter All-In-One print cartridge yielding approximately 700 pages. The Ricoh SP 213SNw and SP 213SFNw B&W Multifunction Laser Printers, when delivered in new condition in the original packaging, are entitled to one year free technical telephone support and are warranted against defects in materials and workmanship for a period of ONE (1) YEAR from the date of original purchase. The All-In-One (AIO) Toner Cartridge that is sold with each device is also warranted with Advance Exchange Warranty Service, for a period of 90 DAYS from the date of original purchase or until depletion of the toner, whichever comes first.